Black Bean Chili is so awesome. I mean it’s the perfect stick-to-the-ribs meal without being excessively high in calories. Besides all that, it’s vegan and gluten free. 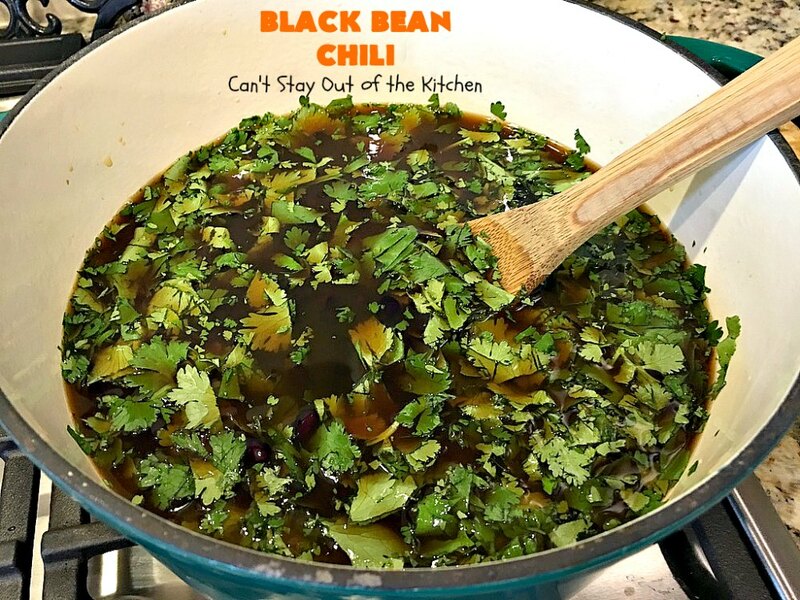 I always appreciate having healthier recipes on hand that I can enjoy especially in the winter months. 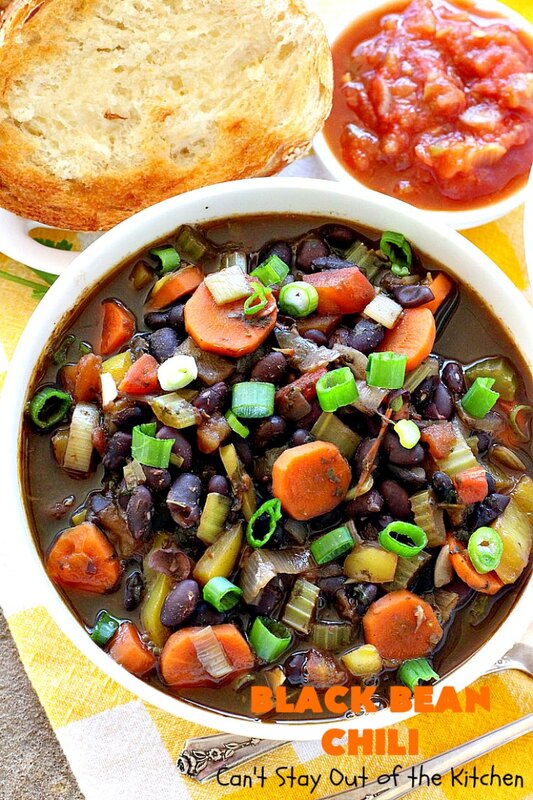 Soups warm me up and fill me up for hours–especially one as hearty as this one. 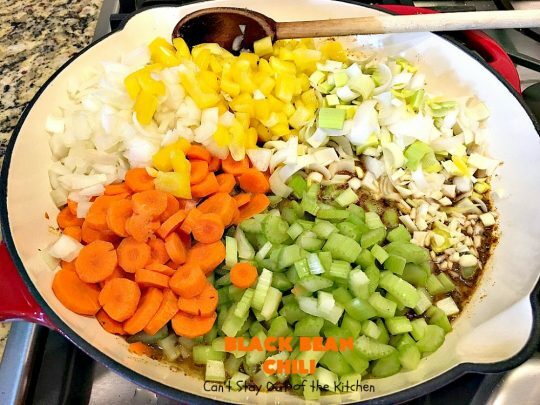 I started with her basic recipe, but added leeks, bell peppers, celery and carrots to provide a little more bulk and include more veggies. 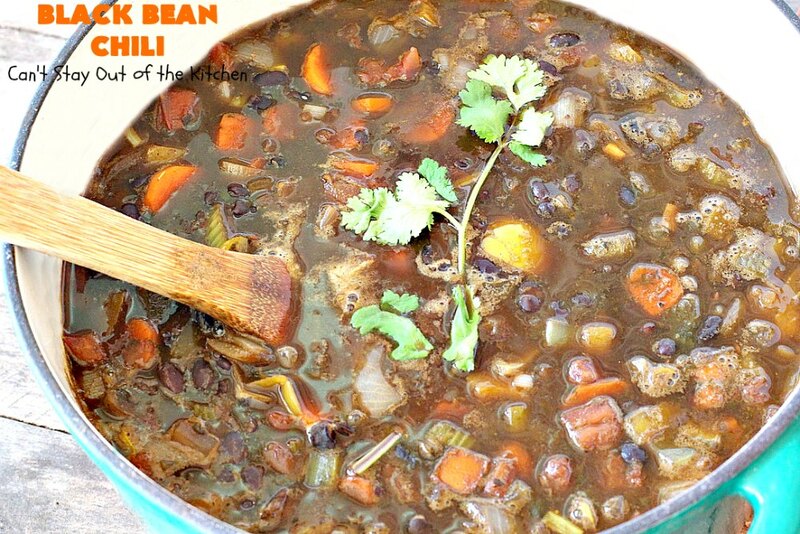 It had the same great flavor I remembered, but it was a little more inviting with all those extra veggies added in. I served it along with a Garden Vegetable Soup to our Friday night care group in January. I warmed up the leftovers for lunches for a couple of days and enjoyed every mouthful. 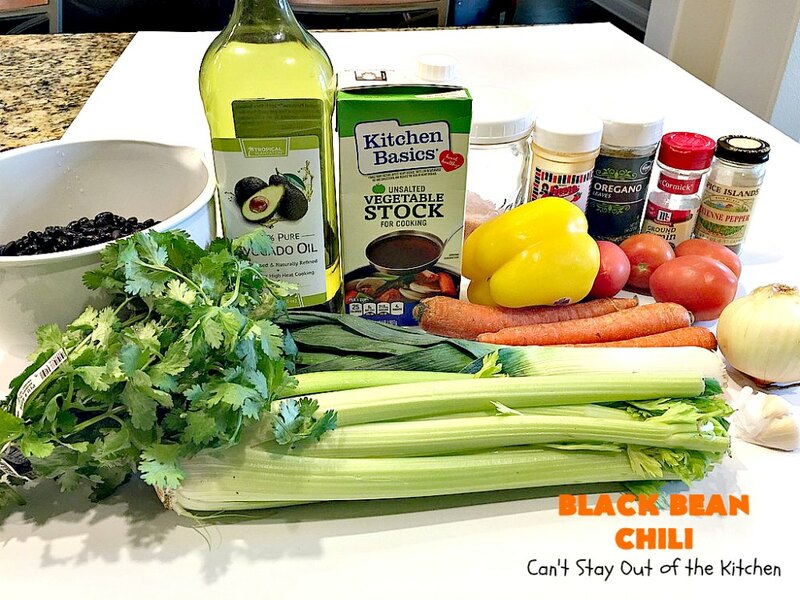 If you’re looking for a healthy, clean-eating Meatless Monday dish that’s vegan and gluten free, then you’ve got to give Black Bean Chili a try. Don’t be surprised if your family wants seconds or thirds. It’s that good. Black Bean Chili is awesome served with salsa and green onions. 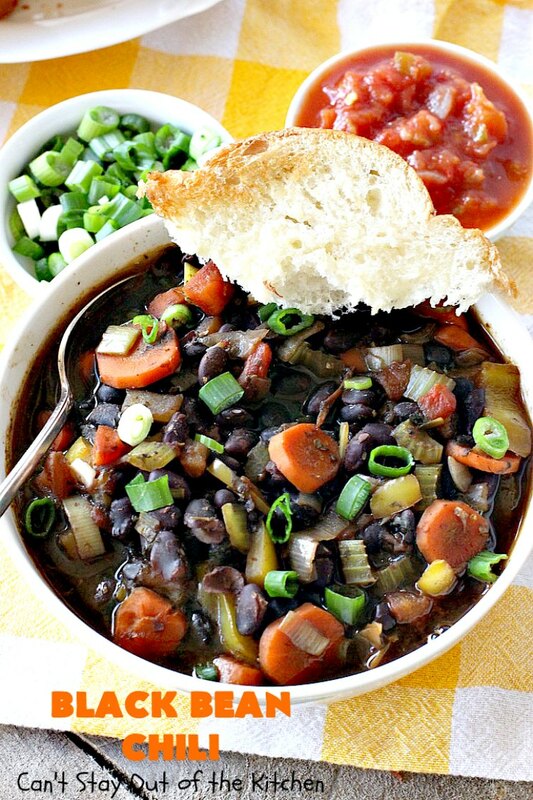 Serve Black Bean Chili with some delicious homemade bread and you have a complete meal! If you’re not vegan it’s also terrific served with a few sprinkles of cheese. I used these ingredients. The black beans were soaked overnight in water. Place soaked black beans and cilantro into a large Dutch oven. Add vegetable stock. Add water. Cover with lid and cook for 2 hours over low to medium heat. Meanwhile, drizzle avocado oil into a large skillet over medium heat. Add cumin, oregano, paprika and cayenne pepper. Stir ingredients and cook a minute or two until spices are fragrant. 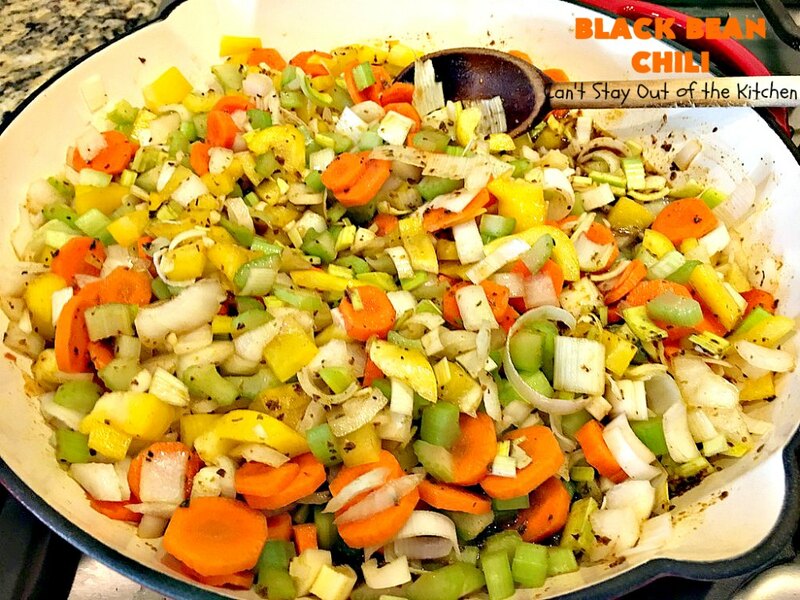 Add celery, carrots, onions, leeks, garlic and yellow bell peppers. Stir to combine and saute about 10 minutes until veggies are mostly tender. Add veggie mixture along with fresh tomatoes into Dutch oven with black beans. Cover with lid and simmer an additional 30 minutes. Season with salt and garnish with fresh oregano or cilantro, if desired. Eating a bowl of this hearty chili will certainly fill you up quickly. I found it hard to eat more than about 1/2 to 2/3 cup at a time because it was so filling. Salsa, cheese and a little bread are the perfect accompaniments for this chili. 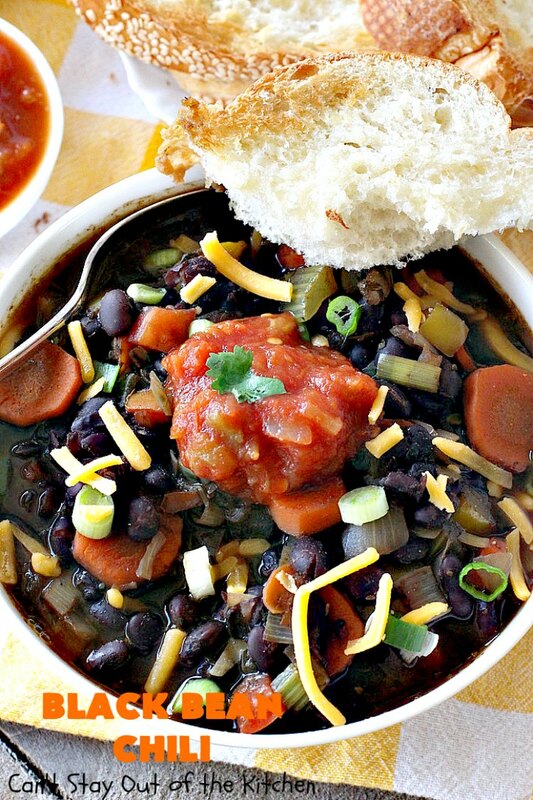 This amazing Tex-Mex chili is chocked full of veggies and so perfect for cold, wintery days. It's hearty, satisfying and delicious comfort food and good for what ails ya! 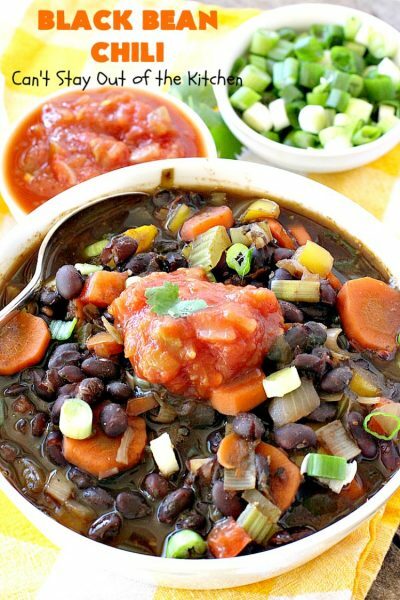 This clean-eating recipe is also healthy, low calorie, gluten free and vegan. 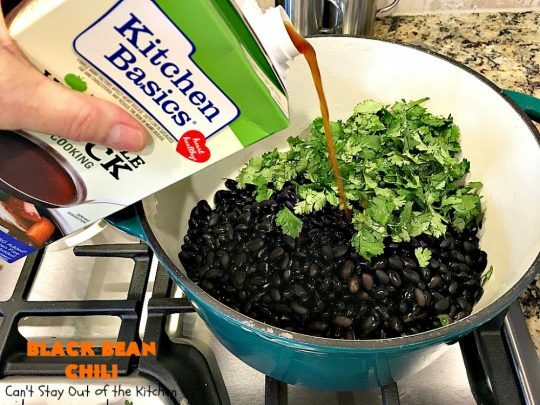 Place beans in a large bowl with 4-6 cups water to soak overnight. Pour off water and discard. Place soaked beans in a large Dutch oven or large stock pot with vegetable broth, 2 cups water and cilantro. 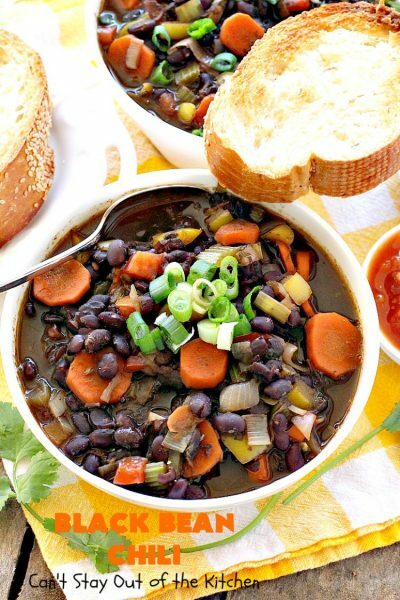 Bring beans to a simmer, and cook until tender—about 2 hours. Heat a skillet over low to medium heat. Add avocado oil and heat oil. 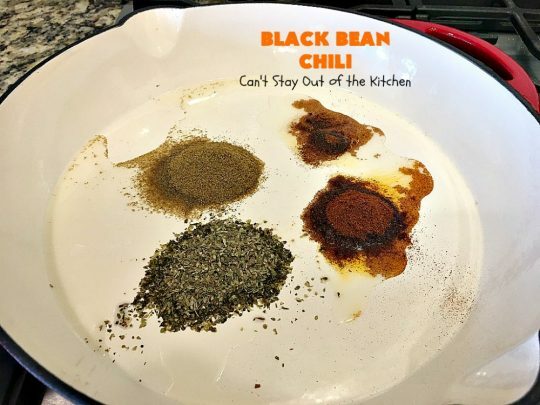 Add cumin, oregano, paprika and cayenne pepper and cook a minute or two until spices are fragrant. 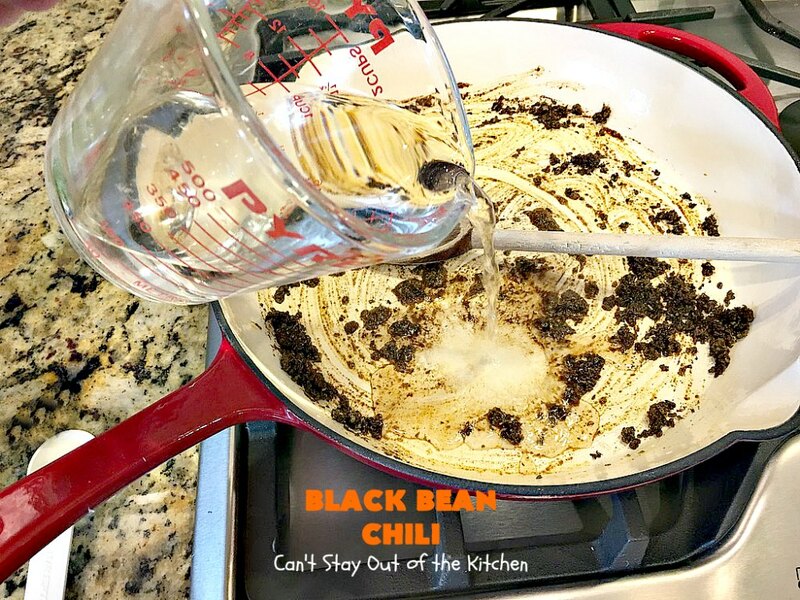 To same skillet add remaining 1 cup water. Stir in the bell pepper, onion, garlic, carrots, leeks and celery and cook about 10 minutes until veggies are soft. 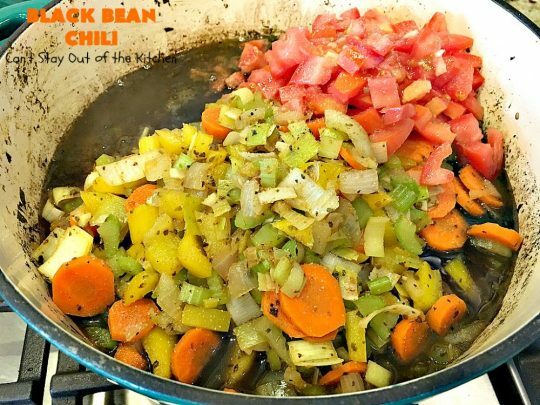 Add veggie mixture to the bean pot. Garnish with fresh oregano or cilantro. 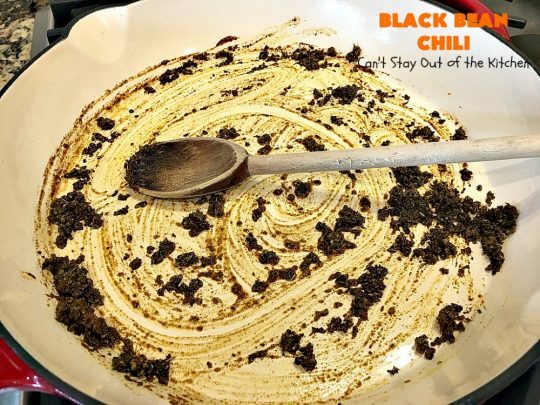 Serve with chopped green onions and salsa. NOTE: For best flavor and digestion, soak the beans in water overnight. Recipe inspired from Gail Harlin, Frisco Lakes, TX; recipe source: inspired from Food For Life by Neal Barnard, M.D. 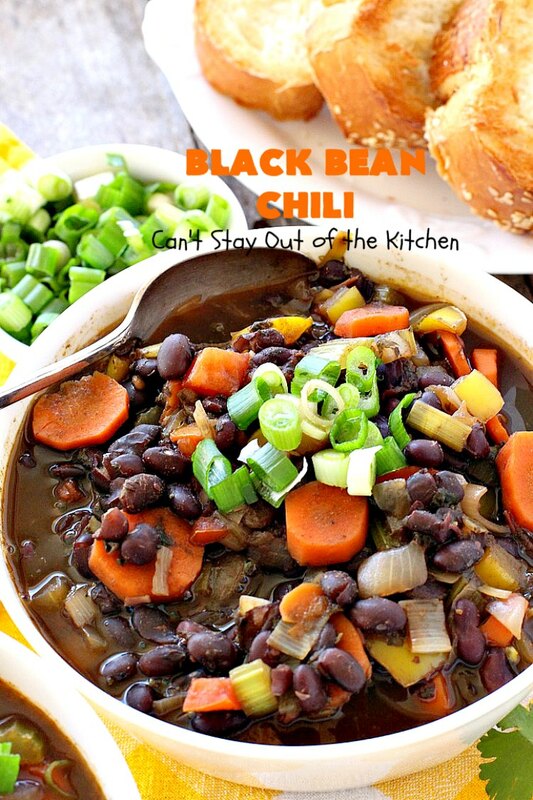 Black Bean Chili is healthy, low calorie, gluten free and vegan. 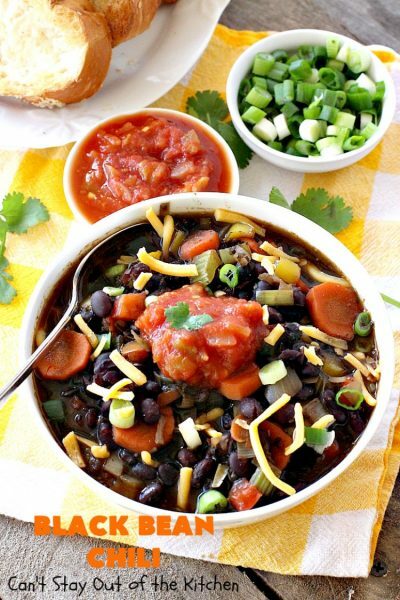 If you enjoy Tex-Mex inspired recipes, this one is amazing comfort food.